We love to help with & talk about home automation. Use Alexa to control Home Assistant. Use Google Assistant to control Home Assistant. Learn about the origin of Home Assistant and where we're heading. Join the Home Assistant t-shirt revolution! All proceeds will be donated to the Electronic Frontier Foundation. Home Assistant will track the state of all the devices in your home, so you don't have to. Control all your devices from a single, mobile-friendly, interface. 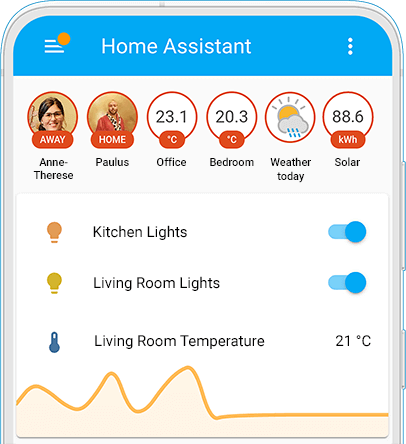 Home Assistant allows you to control all your devices without storing any of your data in the cloud. We like to keep your privacy private. Set up advanced rules to control devices and bring your home alive. have the lights turn on when the sun sets and you are home? have the lights turn on when anyone comes home and it is dark? dim the lights when you start watching a movie on your Chromecast? receive a message when the lights turn on while you are not at home? View examples by the community.